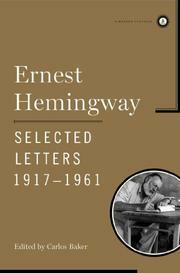 Baker has edited this first-ever collection of Hemingway letters with the sensible idea that everyone knows the life too well to need much explanatory material--particularly who's who; and while you may have to figure out some identities, it was well that Baker resisted the temptation to make the letters stand as a sort of Hemingway autobiography. Read them instead as a novel--some great, full-of-it romance of ego. But as the truth of his life, no; Hemingway seems to have been honestly incapable of telling that. What's fascinating, indeed, is how early all the more detestable traits of the man rushed out. Boastfulness and plain garden-variety lying are already in evidence as early as 1918: a letter to a newspaperman friend, while Hemingway was in New York before leaving for Italy and the ambulance corps, confides that he's engaged to film star Mae Marsh. As Baker drily notes, Mae Marsh never met him. But it's the company of other writers that really sparks the nasty fun. From his brief exile in Toronto, Hemingway writes back to Paris and solicitously informs Gertrude Stein: "They are turning on you and Sherwood [Anderson] both; the young critical guys and their public. I can feel it in the papers etc. Oh well you will get them back again." There's a strong suggestion that Hemingway's Sherwood Anderson-parody, The Torrents of Spring, was in response to Edmund Wilson's remarking that H.'s "My Old Man" read like Anderson; certainly, for the rest of his life, Hemingway's viciousness peaked when he had a secondary or tertiary scapegoat. The only one he was directly beastly to, of course, was "poor" Scott Fitzgerald--to whom H. wrote: you don't know how to think; Tender Is the Night is done all wrong (once Fitzgerald was safely dead, Hemingway would say that it was his best); women destroyed you; you're minor-league and can't finish anything. Before 1938, he could look back and analyze himself--see his famous letter to Stein, in which he says that "Big Two-Hearted River" is an attempt "to do the country like CÃ‰zanne"; but after '38 or so, all of that was gone, blown away by fame so that only the personal gracelessness was left--plus the constant fear. The letters to Max Perkins and Charles Scribner, Jr., with reports of daily word counts, fornication tallys. The letters boasting of how he taught his youngest son an anti-Semitic joke, how he flattened Wallace Stevens in a Key West bar. A remarkably smarmy correspondence with Arthur Mizener on Fitzgerald and other assorted unarmed dead. A scatalogical vendetta against James Jones (whose From Here to Eternity apparently ventured a little too close). Only three sets of Papa letters come off as half-pleasant: to his various wives-to-be and those past; to Bernard Berenson (a late exchange, utterly quirky); and a true--if passive--concern for Ezra Pound in a mental hospital after the war. All the rest is irredeemably grotesque. Fascinating, of course, but strictly as a sort of story--one that dramatizes the tension between the fictional, heroic Hemingway and his mean-spirited creator.